WooCommerce is a fantastic plugin for selling any type of product online. There are also lots of great WordPress pricing table plugins, ideal for creating tables listing your prices. Unfortunately, there aren’t many WooCommerce Pricing Table plugins that automatically create price tables for your products. Most WooCommerce stores end up installing a generic WordPress pricing table plugin and manually entering the prices. That’s crazy because your product prices are already stored in the WordPress database! Today, I’m going to tell you about a different type of WooCommerce pricing table plugin with you. It works by creating automatic pricing tables for your products. No more manual data entry! We’re going to do it with our WooCommerce Product Table plugin. I’ll show you how to use the plugin in a very special way. Instead of creating a product list view, as many people do, we’ll be using it to create a WooCommerce price table. Create automatic pricing tables for your products today! Print Station specialize in printing short runs of digitally printed business cards and flyers. They created a WooCommerce pricing table powered by our WooCommerce Product Table plugin. They’ve used our plugin to create a table of variations and prices because the total price can depend on up to five variables including quantity and paper quality. As a customer makes their selections using the dropdowns embedded into the product table, the price changes with each click. And since changing any dropdown sees the total price change, the customer can easily play around with their order preferences and quickly find out what everything’s going to cost. Read on to find out how you can add a pricing table powered by the WooCommerce Product Table plugin. To show you how to do it, I’m going to create a WooCommerce pricing table for an imaginary online print shop. Since digital printing became a thing, lots of companies have sprung up selling online printing services. 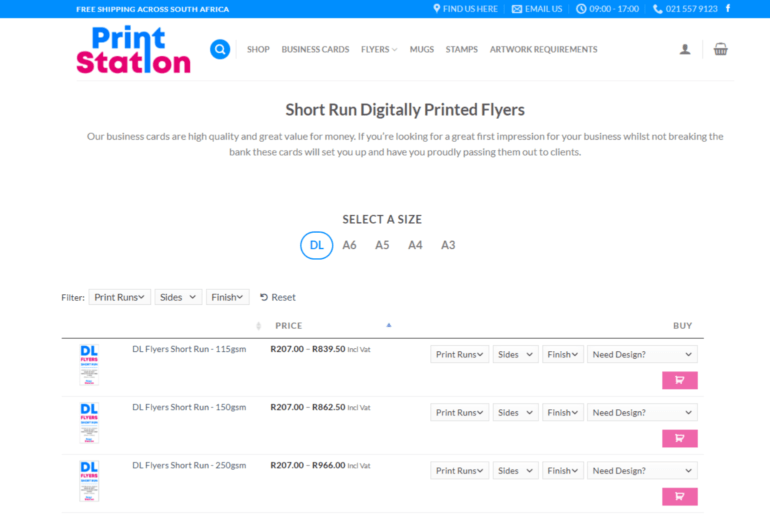 Nearly all digital printing websites provide price lists showing the pricing for each quantity option. For example, an e-commerce site that prints flyers will have a fixed price for print quantities of 100, 250, 500, and so on. You might have different prices for multiple combinations of options – such as size options as well as quantity. A print shop will add their products and any variations so that people can buy online. They also need a pricing table listing the price options, with buy buttons so that people can order the printed materials. The standard usage of WooCommerce Product Table is to list each product as a separate row, with a price column. This is a good way to create a WooCommerce price list of simple products, without variations. The benefit of this option is that as well as the price and add to cart button, you can include extra information about each product. The prices in the ‘Price’ column are generated automatically based on the main WooCommerce price for each product. 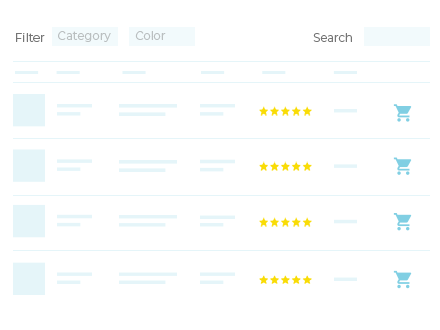 Demo: See this type of WooCommerce price list in action. If you’re using variable products, then you might want to list all the variation options to be visible in the WooCommerce pricing table at the same time. To do this, you can use the plugin to create a table of variations and prices. With this option, the prices shown in the ‘Price’ column are displayed automatically. It shows the correct price for each variation in the product pricing table. With this type of WooCommerce product pricing table, each variation is listed individually. The correct price for that variation appears in the add to cart column. As with Option 1, you have full control over what data to include in the pricing table. You can show or hide columns as needed. In the above screenshot, I’ve removed the image column because each variation option looks the same. However, you can include an image column with individual variations if you like. Finally, you can list product variations as WooCommerce variation dropdowns in the pricing table. Each product has its own row, and the variations appear as options in the add to cart column. As with the other options mentioned above, you can choose whether or not to include a quantity picker so that customers can choose the quantity before adding to the cart. You can also choose which columns to include in the pricing table. Unlike options 1 and 2, this option has a bit of manual data entry if you want to display it like the above screenshot. For this example, I added the columns showing the price for each quantity as custom fields. I then displayed each price option as a separate pricing table column. I like this method because you can list all the prices directly in the table, while still having variation dropdowns. The downside is that you have to add the prices to the custom fields manually – you’d need to do some extra coding to automatically populate these based on the variation values. All the other data in the WooCommerce pricing table – i.e. the product image, name, variation dropdowns, quantity picker and add to cart button – are added dynamically. As you can see, setting up the product pricing table like this leaves more room for extra columns, too. Can I create a WooCommerce pricing table without add to cart buttons? Yes. The plugin can dynamically list product prices in a pricing table without providing the ability to buy now. Simply remove the add to cart column from the price table. This will work with Options 1 and 2. It won’t work for Option 3 because the variation dropdowns can only appear within the add to cart column. Can I add dynamic quantity-based discounts to the pricing table? WooCommerce Product Table integrates with the official WooCommerce Dynamic Pricing plugin. This lets you create complex (and simple!) pricing rules, such as discounts based on the quantity ordered. With this combination of plugins, the Price column will show the standard cost of a single item. If you want to display the bulk discount price for each quantity option, then you’ll need to add it to custom fields and display them as columns in the pricing table. It’s the same method as I mentioned for Option 3, above. Either way, the correct quantity-based discount will be added when the customer selects a quantity from the pricing table and adds the product to the cart. The discounts will be clearly labelled in the cart and checkout. Can I add quick view buttons to the WooCommerce pricing table? 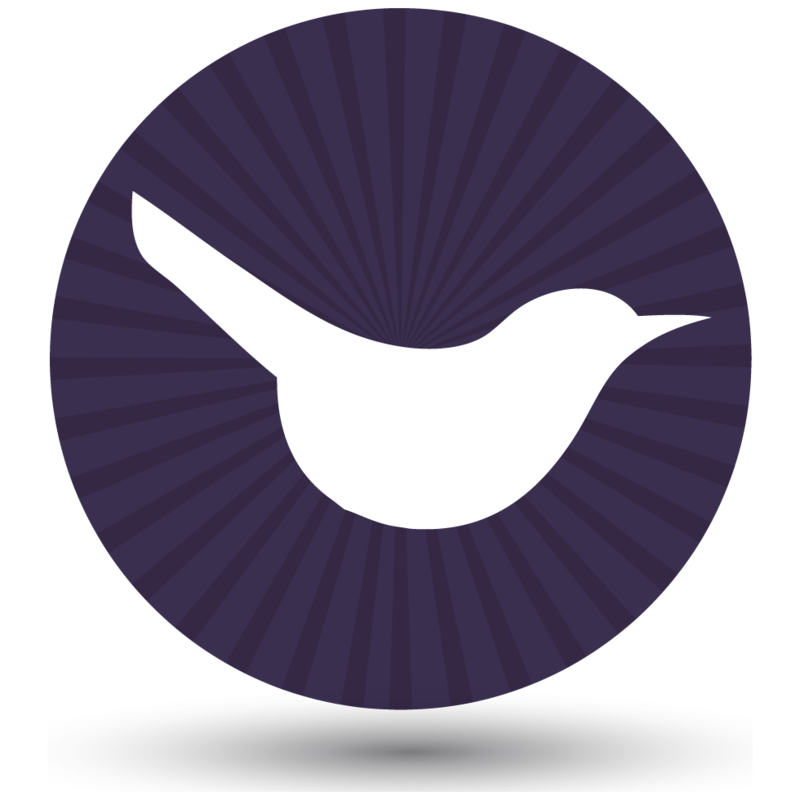 Add quick view buttons or links to the WooCommerce pricing table. A lot of people use WooCommerce Product Table to create simple pricing tables, with quick view buttons so that customers can view extra information and add to the cart. This is a good compromise because you can keep the pricing table simple and minimal, and customers can view extra information in a quick view lightbox. It’s better than taking them to a separate page for each product because the customer remains on the pricing table page at all times. This encourages them to buy multiple products, increasing the average value of each sale. 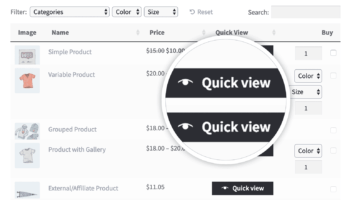 You can add quick view links to the product table by installing the WooCommerce Quick View Pro plugin. It’s designed to work perfectly with your WooCommerce pricing tables, and you can choose whether to open the quick view by clicking on a button, or the product name or image. You also have full control over what information to include in the quick view lightbox. Choose whether to show or hide the full product image gallery. Decide whether to show information such as the short description, price, meta information, add to cart buttons and variations, and more. The WooCommerce pricing table plugin works by listing each product OR each variation on its own row in the table. To create your WordPress pricing tables, you need to work within this layout. For example, it’s not possible list each variation in its own column of the table. Instead, the products and variations need to be listed using one of the layout options I told you about earlier. Plan your automatic pricing tables with this in mind and work with the plugin rather than against it. This is the best way to get good results from your pricing tables. 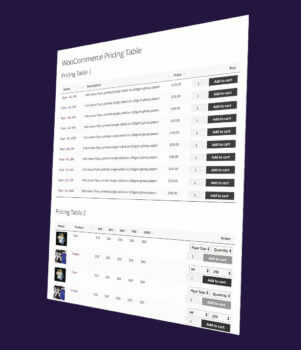 With WooCommerce Product Table, you can stop creating manual pricing tables listing your product prices. Choose one of the 3 methods and set it up today. It only takes a few minutes because the pricing tables are created automatically, using information that is already stored in the database for your WooCommerce products.